"CAFÉ/TAVERN, Item #2312358066, Price $89,000.00. Charming cafe, originally built for the sale of little hamburgers now available. Over the years, the building has been used for many things -- most recently a summer art gallery. Nostalgic little structure, but not historic. Buyer must move to their own land; nice size for coffee-house, art studio or guest cottage. 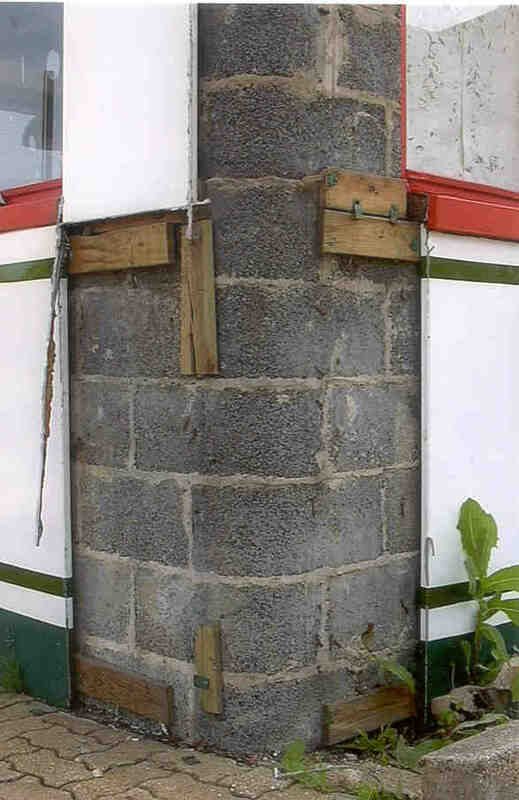 Single story, concrete block, rectangular building approx. 16 by 42 ft. Front and back doors, plus 2 "railroad-car" style bathrooms. Renovated in the mid-1980's to include a metal panel exterior and peaked metal roof facade. Stainless steel refrigerator cases and A/C working; needs new heater and some plumbing work. All reasonable offers considered." 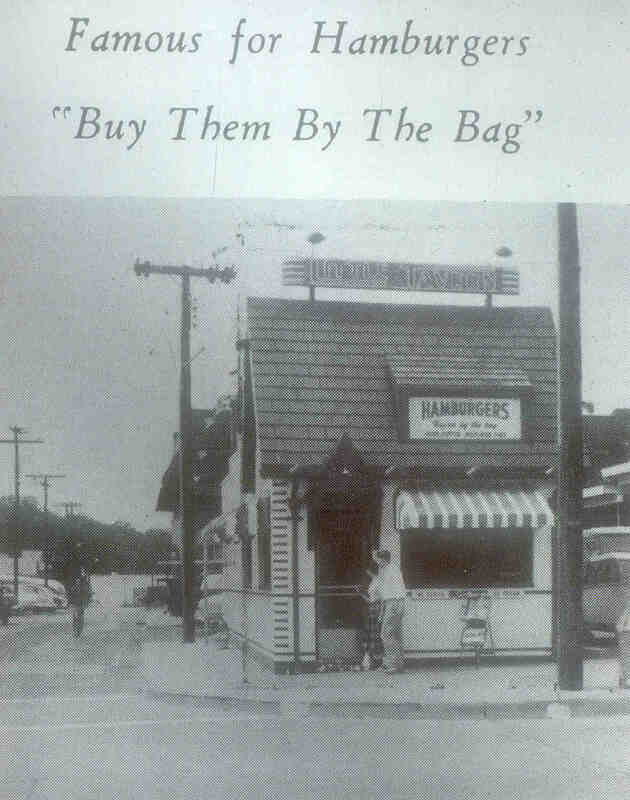 What was being marketed as a cash and (literally) carry commodity was a piece of downtown Silver Spring's cultural history, the 1940 Little Tavern Shop, located at 8230 Georgia Avenue at the corner of Ripley Street. The seller of the building was Pyramid Atlantic, a non-profit arts organization involved in the creation of handmade paper, printmaking, digital media and the art of the book. In 2001 Pyramid Atlantic had announced plans to relocate from their Riverdale, MD home to downtown Silver Spring. Their chosen location was the former Little Tavern property, consisting of the Little Tavern hamburger shop and the Little Tavern corporate headquarters, located to the rear at 1007 Ripley Street. Shortly after the '01 announcement an architectural rendering appeared in the 6/6/01 Silver Spring Gazette depicting the proposed design of Pyramid Atlantic's new home. Incorporated into the project was the Little Tavern, artistically-rendered with a "Café" sign (flanked by a steaming cup of coffee!) replacing the structure's original signage which had proclaimed for nearly half a century the hamburger chain's motto "Buy Them By The Bag." Little Tavern's corporate headquarters, a modest two-story brick structure displaying modest art deco-inspired windows, had been included in the proposed design. Filling in the spaces formerly used for parking located both behind and to the side of Little Tavern was a glass, post modernist-designed gallery, which would serve as exhibition space. I have long loved art and hold great admiration for those who create it. Jubilant over the news of Pyramid Atlantic's pending arrival, I had envisioned being one of the first to sign up for one of their papermaking classes. I wanted to finally learn how to make paper from the bark of a fig tree, a manufacturing process used by the Mayans of Yucatan since about 500 A. D. Why paper from the fig tree bark? In the yard of my Thayer Avenue bungalow grows a fig tree. Every winter some of the old growth is pruned out and I always thought it was a waste to dispose of the branches because I knew, somehow, that paper could be made from it. I couldn't wait to patronize a local organization where I could learn this craft and, at the same time, support an organization that appreciated the importance of my community's cultural and architectural history. In short, Pyramid Atlantic was an organization that operated "outside the box" and would offer to their new community a noteworthy example of how an historic structure could be adaptively reused and given a new lease on life. By 2002, instead of thinking "outside the box," Pyramid Atlantic had thought of the box! A new architectural rendering began appearing on Pyramid Atlantic's promotional materialsin place of the Little Tavern was now a non-descript cube, void of any life or architectural interest. This glass cube, representative of the design ethic of the 1970s, turns out to be Pyramid Atlantic's eventual vision for their new $4.75 million contemporary art center, dubbed SEMAT (the Site for Electronic Media, Art and Technology). Besides being completely out of context with the architecture of its surrounding early-20th century neighbors, it appears that this planned design might also eventually doom the Little Tavern corporate headquarters, thus destroying the last vestiges of Harry F. Duncan's empire. Who was Harry F. Duncan you ask? Why that's like asking who Ray Kroc was (for you youngsters out there he was the guy who in 1955 started a small hamburger franchise in Des Plaines, IL called McDonald's). Duncan founded his Little Tavern chain in 1927 in Louisville, KY, a full quarter century before Kroc (and no, Little Tavern wasn't the first hamburger chainthat honor goes to White Castle, founded in Wichita, Kansas in 1921). In 1928 Harry and his wife Doris moved to Washington, DC where they established their first Little Tavern Shop (or second as the case may be) at 814 E Street, NW. The Duncans turned to engineer Charles E. Brooks and architect George E. Stone of Baltimore's Stonebrook Corp. who came up with a design for a hamburger stand based upon traditional Tudor cottage architecture. For the rapidly growing quick-lunch market, a Tudor "cottage" was meant to evoke feelings of warmth, familiarity and good food. The look featured smallness of scale, a steep roof, dormers and quoins. To instill a sense of modernity and cleanliness, the materials utilized in the construction of the shops featured materials and design techniques used in innovative ways porcelain enamel steel panels, plate glass windows, neon signage, interior stainless steel and streamlining (the exterior corners were slightly rounded with alternating stripes of enameled green taking the place of traditional stone, brick, or even wooden quoins!). By 1939 Washington, DC alone had 21 Little Tavern Shops with dozens more distributed throughout the suburbs and as far away as Baltimore. Silver Spring's Georgia Avenue location is shown here in a photograph that appeared in the 1957 Montgomery Blair High School yearbook Silverlogue. Anybody know who the Blair students are, a boy and a girl, peeking into the front door? By the early 1980s with changing tastes and skyrocketing property values, especially sites in the inner city, the ranks of Little Tavern locations had been reduced to around 30 shops. The franchise was in need of new life. Around 1983 in stepped Gerald Wedren and his architect, Timothy Crosby. Together they restored six Little Taverns with 8230 Georgia Avenue being one of them. The flagship Washington, DC restoration was Little Tavern #6, built in 1931 and located at 630 N. Capitol Street, across from the main post office. In 1988, only five years after its loving restoration, the building was sold and demolished. A parking lot occupies the site to this day. The most touted Little Tavern restoration in Montgomery County was the circa 1939 structure located in Bethesda at 8100 Wisconsin Avenue. So well-done was its restoration it was listed on Montgomery County's Master Plan for Historic Preservation but sadly the current owner, Golden House Chinese Carry-Out, has eradicated all of the restored Little Tavern signage. The same owner has made even more alterations to Silver Spring's other Little Tavern, a circa 1950s model located at 900 Wayne Avenueit has been completely painted yellow! 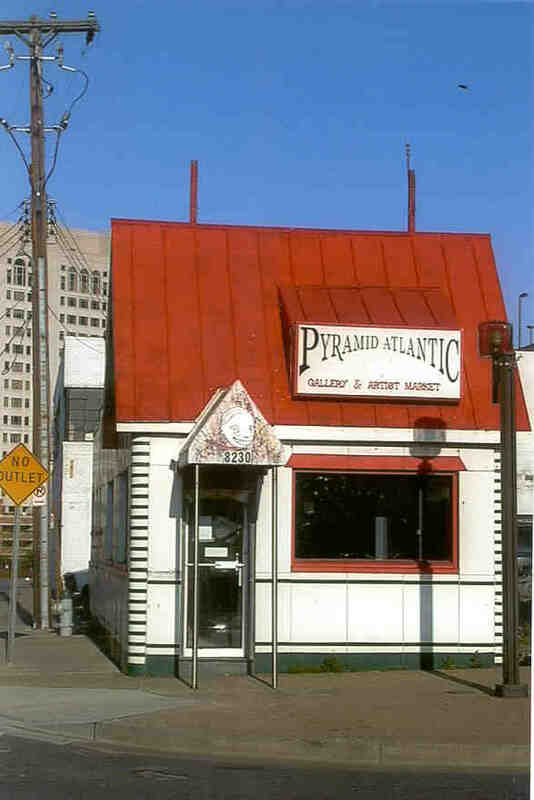 Perhaps Silver Spring Voice readers can encourage Pyramid Atlantic to retain Little Tavern in their SEMAT project, if only the portion ensconced under that famous green roof, now replaced with a standing metal-seamed roof and painted red (shown here in a photo taken 4/24/03). Artists by nature are supposed to create art, not to destroy it. Silver Spring's Little Tavern is a wonderful example of the "art" of mid-20th century Commercial "Roadside" vernacular architecture. This building has been a presence in downtown Silver Spring for almost 70 years. To simply view a piece of our history as a monetary-gaining opportunity is disrespectful to future generations of Silver Spring residents who would view this patrimony as unique. Please write, call, or email Pyramid Atlantic's Executive Artistic Director Ms. Helen C. Frederick and ask her to not sell Little Tavern and permanently incorporate it into the plan for the site. Ms. Frederick can be contacted at Pyramid Atlantic, 6001 66th Avenue, Suite 103 Riverdale, MD 20737; Phone: 301.459.7154; Fax: 301.577.8779; Email: pyratl@earthlink.net. All of Pyramid Atlantic's artists and visitors are going to need somewhere to take a break from creating and viewing art and the use of Little Tavern as a cafe would provide a perfect, welcoming respite! If you can share with the Silver Spring Historical Society photographs or memorabilia of downtown Silver Spring from ANY years for use in a future book, please contact SSHS at PO Box 1160, Silver Spring, MD 20910-1160 or email sshistory@yahoo.com. The society's web site is www.sshistory.org. Future residents of Silver Spring will thank you! BELOW: Photographed April 24, 2003. Photo by Jerry A. McCoy.